International Women’s Day, celebrated worldwide every March 8th, apart from religious feasts, is the oldest internationally observed annual holiday. It came about via Clara Zetkin, a German writer, politician and public speaker who considered feminism a phenomenon for upper class women; to Zetkin, it was socialism that would set working class people free, women and men alike. But that didn’t stop her proposing a special day to demand equal rights for women – universal suffrage specifically – at a Socialist Women’s International meeting in Copenhagen in 1910. The proposal was accepted and from 1911, Women’s Day was celebrated on March 19th, mainly in German-speaking countries. Portrait of Zetkin painted by her husband Georg Friedrich Zundel. Photo by Robin Oomkes. In 1917, as a reaction to the horrors of World War I, German communists added the concept of ‘peace’ to the day’s objectives. The date was moved to 8th March in 1921 as a tribute to the strike organised by female workers in St. Petersburg that triggered 1917’s February Revolution – Russia at the time was still on the Julian Calendar so March 8th in the West was February there – which in turn marked the beginning of Russia’s socialist revolution. In Germany, Women’s Day is still very much regarded as a socialist as well as a communist phenomenon. After the 1917 split between Communists and Social Democrats, there were even two separate Women’s Days for a while, which the Nazis replaced with a single Mother’s Day to undermine the event’s leftist credentials and emphasise the importance of motherhood. After World War II, the Soviet Authorities reintroduced Women’s Day in the Eastern Zone and it remained a state-sponsored socialist affair until the end of the GDR in 1989. 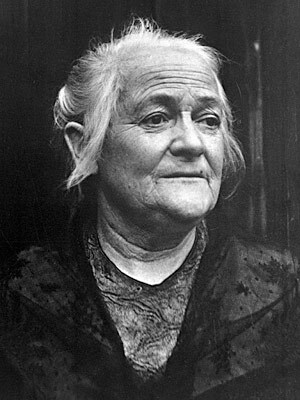 The GDR memorialised Zetkin by putting her on their ten mark banknote and twenty mark coin and, in 1954, established the Clara Zetkin Medal (Clara-Zetkin-Medaille) to honour female women’s rights activists. Its communist connotations meant that West Germany hesitated introducing its own Women’s Day until the broader feminist movement gathered pace there during the 1970s. Likewise, the United Nations only moved towards creating an International Day for Women’s Rights and World Peace in 1975, and it took until 1995 onwards to become a fixture on the UN calendar. 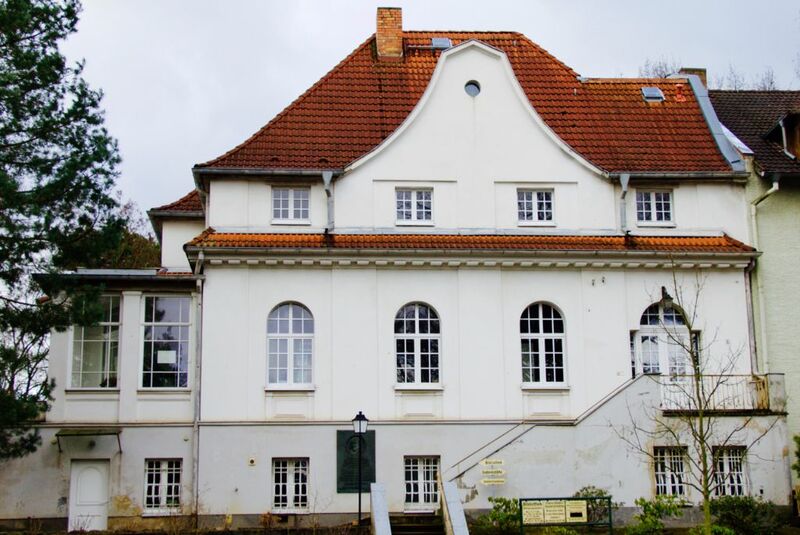 Zetkin’s Birkenwerder house, now a public memorial. Photo by Robin Oomkes. In order to learn more about Zetkin and the day she created, I took a trip to Birkenwerder, in the north of Berlin, a 30-minute trip from Friedrichstrasse. Alighting at Birkenwerder S-Bahn station, I crossed the railway tracks and followed the signs to her memorial, which is set inside the last German house in which she lived. After a ten minute walk I found myself outside the village library that now occupies the lower part of the house. The librarian, who seemed happy that someone was interested in the museum, took me upstairs and showed me around the two room exhibition. When I asked her if anything special was planned there for March 8th, she seemed sorry to say that there wasn’t. But she said that from time to time, women’s clubs from the ex-GDR do come and visit the memorial. 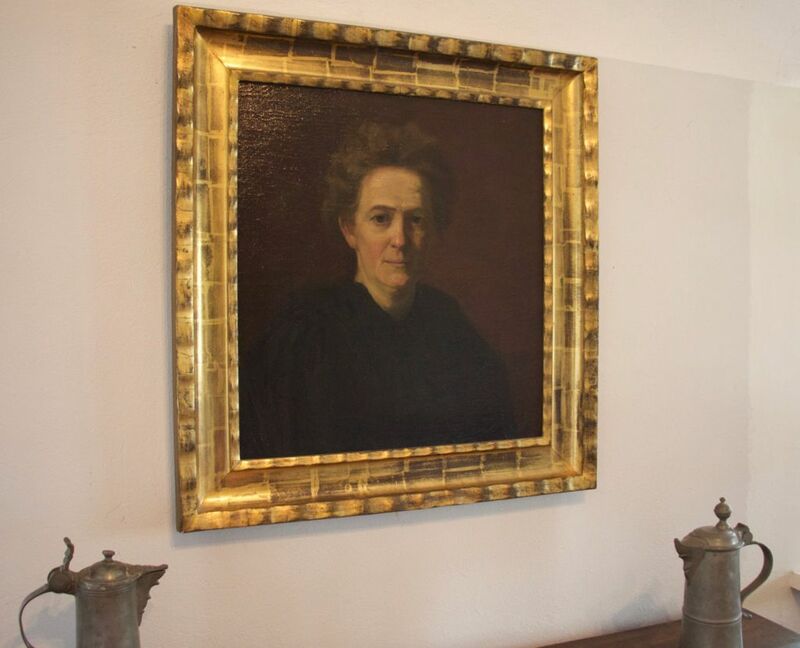 Inside, Zetkin’s sitting room is preserved as it was in the early 1930s, complete with writing desk and mementos from her life, during which she rubbed shoulders with famous socialists such as August Bebel and Rosa Luxemburg. She was even visited by Lenin himself in 1907, and she interviewed him in 1920 about the topic of women’s rights. Another room documents her life and work via a series of German texts. I learned that she was born Clara Eissner in 1857 to a devout Saxon school teacher and his educated wife, that she trained as a teacher – the only career open to girls from her background in those years – and joined the Socialist Workers’ Party in 1878. Moving to Paris to escape Bismarck’s anti-socialist laws, she met Ossip Zetkin, from whom she took her name – despite not being married – and bore two sons, Maxim and Kostja. After Zetkin’s death, she married painter Georg Friedrich Zundel, also a staunch socialist. Throughout her life, Zetkin maintained strong ties to the Socialist International group. Following the party’s 1917 split from the SPD (due to its pro-war stance), she helped co-found the Spartacus League with her close friend and political companion Rosa Luxemburg. 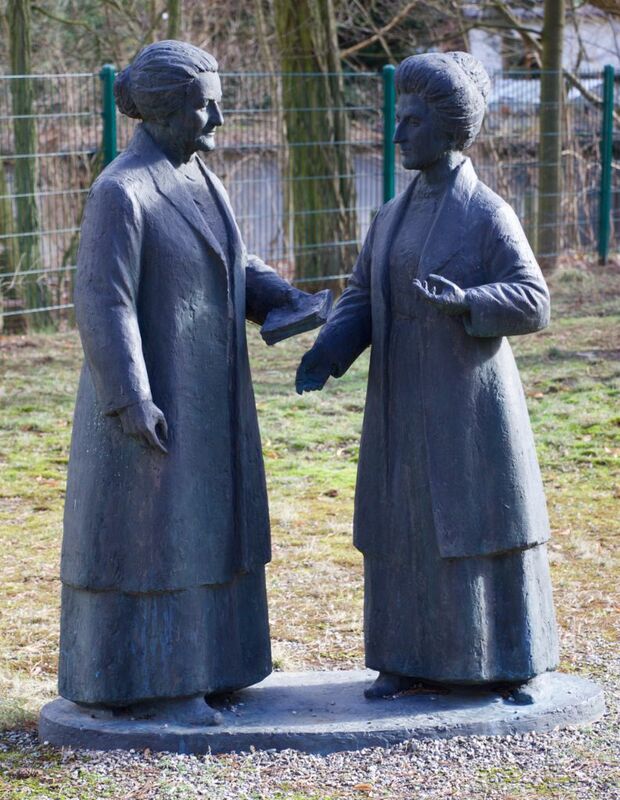 Statue in the memorial’s garden showing Clara Zetkin (l) and her friend and fellow communist Rosa Luxemburg. While Luxemburg didn’t survive the Communists’ 1918 revolution attempt and the subsequent crackdown by the ‘bourgeois’ parties (including the social-democrat SPD) that followed, Zetkin managed to continue her political career. In 1919 she joined the fledgling KPD (Communist Party of Germany), representing the party from 1920 in the Reichstag and serving, between 1927 to 1929, as a member of the central committee. After separating from Zundel in 1928, when he turned increasingly religious and mystic, Clara’s son Maxim bought her the house at Birkenwerder, which enabled her to live closer to her work at the Reichstag (the S-Bahn was as fast and practical then as it is now), and where she remained a member until the Nazis took power. Gift charger received from Russian porcelain workers. 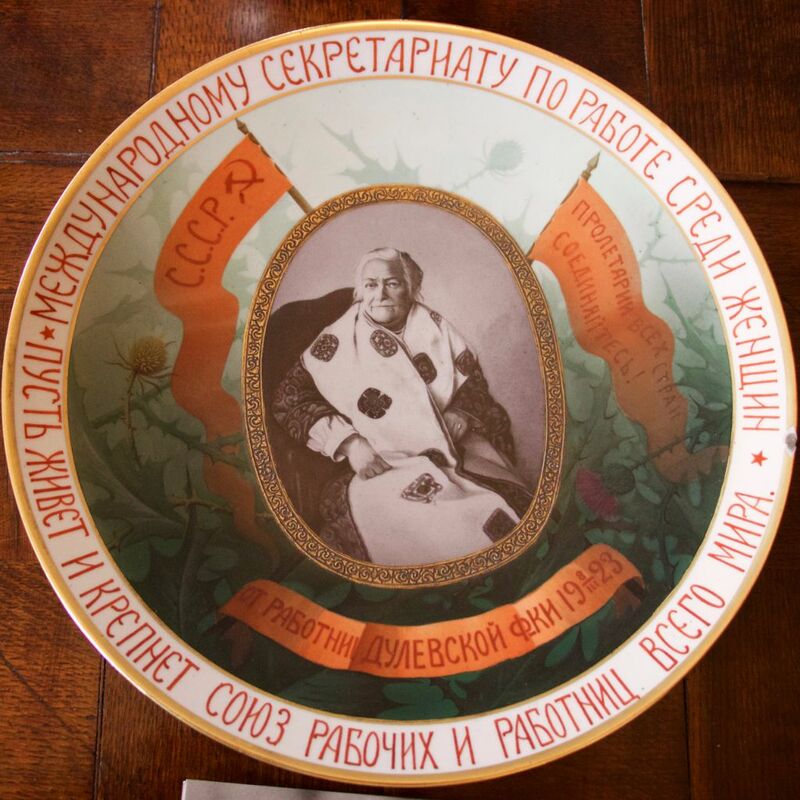 The inscription says: “USSR – Workers of the World Unite – To The International Women’s Secretariat – From the workers of the Dulevo Porcelain Factory 8 March 1923 – May the union of male and female workers of the world flourish and strengthen”. Photo by Robin Oomkes, translation by Chris Hernon. As the party’s most senior MP, she had the honour of opening the first parliamentary session after the 1932 election – in which the Nazis polled 33% – and used the opportunity for a courageous 40-minute speech against the dangers of National Socialism. Soon after the Nazis came to power, she fled her native country again, this time to Moscow, where she died the same year of natural causes. Stalin himself carried her urn to the Kremlin Wall Necropolis. Many streets in eastern Germany are still named after the “mother of German communism”. One of the most important disappeared however. Today’s Dorotheenstrasse in Berlin-Mitte, which Zetkin would have probably walked along as part of her commute between S-Bahn Friedrichstrasse and the Reichstag, was named Clara-Zetkin-Strasse in 1951 – but in 1995 it was restored to its prewar name, honouring Prussian Queen Dorothea. Directions: take any regional (RE) or S-Bahn train towards Oranienburg, get off at Birkenwerder Station. Take the road bridge across the tracks and turn left on Unter den Ulmen, then right on Summter Strasse. Alternatively, walk along An der Bahn and take the magnificent footbridge (Rote Brücke) across the tracks and straight into Summter Strasse. It’s less than 1km either way. As my time in Berlin is coming to an end, I’d like to share a series of portraits of Favourite Berliners that I wrote over the past few years on request of Slow Travel Berlin editors Paul Sullivan and Brian Melican. Here’s the first: Wilhelm von Humboldt. The name “Humboldt” to most people brings up images of South American jungle expeditions and scientific breakthroughs in geography, botany and zoology. But that was Alexander. His brother Wilhelm, two years his senior, may have led a less spectacular life, but probably had a greater overall impact on scholarship, and universities in particular, than his more famous younger brother. The Humboldt brothers grew up on their parents’ estate at Schloss Tegel outside Berlin. Their father died when Wilhelm was twelve, and the boys were brought up in relative isolation by their mother. They were home-schooled by a succession of tutors, who did a great job intellectually. However, both Humboldts later described the atmosphere as oppressive. To escape, extroverted Alexander explored the Tegel woods, but Wilhelm, who was quite an introvert, dug himself ever deeper in books, especially Greek Classics. Schloss Tegel, the family pile, after Schinkel’s remodelling. The four corner towers carry the names of the Greek winds (photo: Robin Oomkes). When Wilhelm was 18, their tutor ended the brothers’ boredom by introducing them to the main characters of Berlin’s Age of Enlightenment. They met Henriette and Marcus Herz, and were immediately accepted into their philosophical and literary salons. Wilhelm probably had a crush on Henriette, but it was she who introduced Wilhelm, very much a womanizer, to the love of his life, Caroline von Dacheröden. After finishing university at Göttingen, Wilhelm wrote to Alexander how much he was looking forward to a simple, bourgeois life with Caroline in Berlin. But Alexander, who may have been gay, was abhorred by such a boring existence. Both brothers recognized the way in which their characters contradicted and complemented each other. Alexander wrote about Wilhelm: “He is a wonderful person. But it’s easy to get him wrong. He can be very offensive, like Goethe, repelling, or forcibly civil. It all happens inside him, he’s too esoteric. And his marriage reinforces that apparent aloofness and coldness. Apparent, because it is not really what he is like … He is the strangest being I’ve encountered”. Caroline von Humboldt, née von Dacheröden (1766-1829). Litho by Wilhelm Wach. Wilhelm and Caroline moved to Thuringia, where he continued his writing on the conflict between the spiritual and the sensual. Mankind’s objective was to achieve the Great and the Whole, and the individual should edify and educate himself. Only then would he be able to exercise any wider impact on the outside world. In Jena, Wilhelm was introduced to poet Friedrich Schiller. In 1794, Wilhelm (and Alexander, who was visiting), finally managed to get to meet famous writer and statesman Johann Wolfgang von Goethe. The meeting of Goethe, Schiller, and the Humboldts is now seen as the kickoff of the Weimar Classics literary movement. In 1802, Wilhelm became the Prussian King’s ambassador to the Vatican. Alexander, who had just returned from his South American expedition, had vowed ‘never to set eyes on the towers of Berlin again’ and set up house in Paris, but Wilhelm implored him to not relinquish his “Germanness”, return to the city, “even if it is a sandy waste”, and report to the King on his travels. As a result of the Napoleonic Wars, Prussia had not only lost a great deal of territory, but also the universities that were located there. King Frederic William III had vowed “to replace lost territory with intellectual prowess”, and in 1808, he appointed Wilhelm, who didn’t want to leave Rome, as education secretary and asked him to reform the education system. The system that Humboldt designed was true to his convictions and put the human spirit at center stage – not the needs of the state, or any specific profession. It consisted of elementary education, where the student learns how to express and understand thoughts, secondary education, where pupils gather linguistic, mathematical and historical knowledge, and at the same time learn to learn. At university, the third stage, students should conduct their own studies, guided and supported by professors. Wilhelm’s educational theory projected his own intellectual development on Prussia’s schools. Wilhelm von Humboldt’s statue (Paul Otto, 1882), outside the university building on Berlin’s Unter den Linden that bears his and his brother’s name. The only thing missing in Berlin was a university. In 1809, Frederick William allowed Wilhelm von Humboldt to create one. Berlin University started operating only a year later, at the palace on Unter den Linden that is still its headquarters today. It was named after the King in 1828, and then after the Humboldt brothers in 1949. The combination of teaching and research, which made sure that students would always be taught cutting-edge insights, was a unique tenet of the Humboldtian education ideal. Berlin’s university may be relatively young, but it was so ground-breaking that its teaching system has made a major impact on universities worldwide. After several stints as ambassador and minister, Wilhelm got disappointed with Prussian politics, discovering that, post-Napoleon, he couldn’t implement his Enlightenment ideals and his passion for a unified German nation. From 1818, he returned to life as an independent writer and scholar. He spent the rest of his life at Tegel, where he asked Karl Friedrich Schinkel to redesign his parents’ manor house, studying exotic languages but never travelling far from home again. His theories on languages and their “world views” (Weltansichten) still have their followers today. Wilhelm von Humboldt’s desk in his study at Schloss Tegel. Photo: Robin Oomkes. Caroline’s death in 1829 caused Wilhelm immeasurable sadness. Fearing Humboldt would end up a total recluse at his Tegel retreat, the King called upon him to set up the collection of the new museum in Lustgarten (known as Altes Museum today), which would at least get him to travel to Berlin several days per week. Wilhelm von Humboldt died at 68, at his home in Tegel. He lies buried there, together with Caroline and Alexander. The country house, with its memorial, is still the private residence of descendants of the Humboldts, but there is a small museum that opens on Mondays from May to September. Further reading: Manfred Geier: Die Brüder Humboldt. Eine Biographie, Reinbek bei Hamburg, 2009.